For this card I went pretty simple once again, as I have to make a LOT of these. I switched out the bottom of the cupcake since you can mix and match all the cupcakes tops and bottoms in the Cupcake Builder set. The top of the cupcake was coloured in with Zig Glue and I added Doodlebug glitter to make my cupcake sparkle. I totally forgot to stamp an oval beneath the cupcake as a shadow, I’ll have to do that later tonight. I love this particular sentiment from A Muse because it’s great for so many occasions – halloween, birthdays, valentine’s, easter, etc. I wish I could get the 4.5″ square envelopes because I think this card would’ve been cute as a square but alas, those envelopes are impossible to find. If you know where I can get some, please let me know! 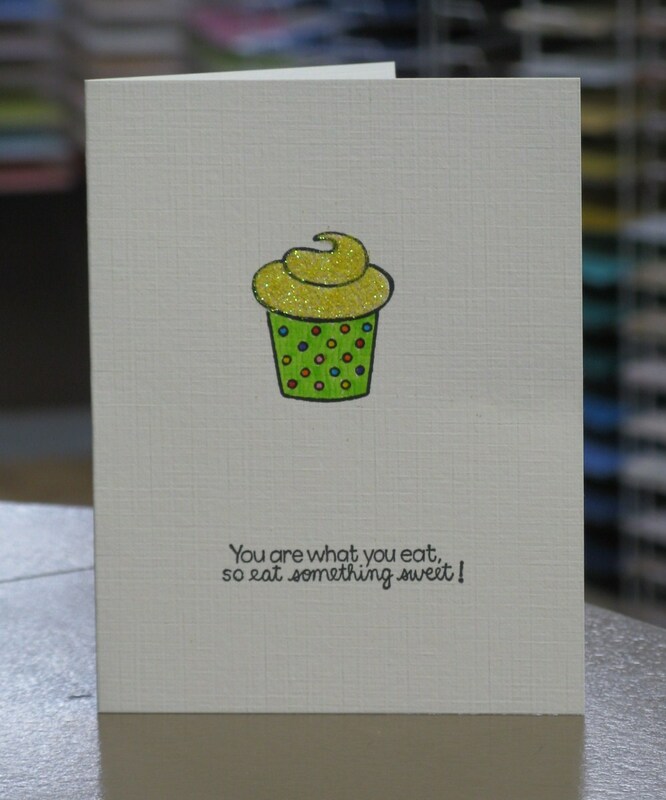 Super, super cute cupcake cards!! I am loving every one of them!